First off, do not let the headline mislead you. In no way does it imply that Sunderland are already destined for doom. They aren’t, not yet at least Mathematically, even old ‘Arry’s Queens Park Rangers have a chance of boring the Premier League for another full season (but we all know that’s not happening). Sunderland, at the time of writing, sit 16th in the EPL table, with 31 points, ahead of Wigan, Aston Villa, QPR and Reading. Save for Reading, all of them have a game in hand. So, like most owners in the Premier League, Sunderland owner Mr. Ellis Short saw it fit to show his manager out the door, and try and salvage something from what has been an entirely forgettable season. And so, Martin O’Neill was relieved of his duties as Sunderland manager with immediate effect, after their 1-0 defeat to Manchester United at home yesterday. 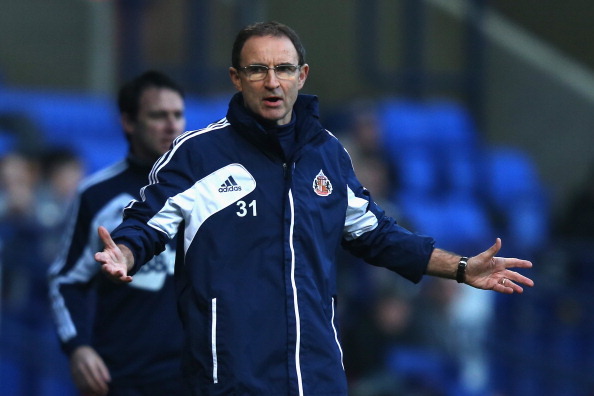 However, anyone who watched Sunderland play last night and arguably over the entire season will be aware that their predicament has more to do with a lack of quality in the side than with Martin O’Neill’s management. O’Neill has done enough in his 26-year long managerial career to justify the respect that he warranted, and his spells at Wycombe, Leicester City, Aston Villa and above all Celtic, stand testament to his impeccable man-managing abilities. However, they seem to have had no effect on a Sunderland squad devoid of inspiration and leadership within the ranks. What befell the players is a mystery though. The bright sparks of last season are either no longer in the team (Nicklas Bendtner), or are far from the form of last year (Stephane Sessegnon, James McClean, Sebastian Larsson). In their decline, players like Craig Gardner and Adam Johnson have failed to step up to the plate. Adam Johnson, above all, is a peculiar case. For so long seen as the ‘next big thing’ of English football, Johnson has been more of a confused, aimless individual at Sunderland who seems to have no coordination with his team-mates, and often embarks on blind runs down his favoured right wing. His return of 4 goals and 8 assists may not seem shabby, especially when compared to the rest of the team, but his contributions have only been in spurts through the season. Consistency has been completely lacking in his play, and he may have proved his former manager Roberto Mancini right, who accused Johnson of lacking consistency and discipline. Martin O’Neill is known to be a thorough taskmaster though, and if neither him nor Mancini have been able to drill any sense into Johnson, then it must be said that a player capable of doing all this, will have penned his name down onto a long-list of England hopefuls who never quite made it. O’Neill may have blundered in repeatedly persevering with the stuttering winger and keeping Sebastian Larsson out of the side. Larsson was one of Sunderland’s top scorers last season with 8 goals, and even when not scoring, his dead-ball ability is arguably one of the world’s best. Sunderland have also been massively let down by the continued absence of Lee Cattermole, who seemed to be the only Sunderland player with any discernible leadership qualities. O’Neill’s replacement, whoever he is, will struggle to maneuver around the inherent lack of creativity in the side. Craig Gardner and Alfred N’Diaye are hardly ideal playmakers, and Sessegnon seems unsure of exactly what his role on the pitch is, with his drifting all over the park. Sunderland have also been greatly hampered by the absence of their most potent outfield player, Steven Fletcher, whose ten league goals are the only thing standing between them and outright relegation. He has been ruled out for potentially the remainder of the season, and that has significantly bleakened Sunderland’s survival hopes. While Danny Graham – who was bought in as back-up to Fletcher in the Winter transfer window – is a potent striker, he has hardly ever been prolific in his career, and his success at Swansea was built around the supply from players like Dyer, Sinclair, Britton, Sigurdsson, and this season, Michu and Pablo Hernandez. In Fletcher’s absence, Graham has struggled, and will continue to do so till he receives any notable supply from his midfield. The shoddy defence has been continually let off by the commendable work of Belgian goalkeeper Simon Mignolet, who has constantly stood out in mediocre company to let his team off the hook. The new manager will have a gargantuan task on his hand, trying to get the best out of one the most under-performing teams in the league, and trying to keep them up. Media reports put former QPR manager Mark Hughes in the driver’s seat to take over at the Stadium of Light. But given his recent antics with QPR last season, and for most of this season, Ellis Short would be making a highly unwise decision. The future does not look too bright over at the Tyneside club, which seems to be making the same mistake Wolverhampton made last season, that of sacking Mick McCarthy and appointing the helpless Terry Connor.